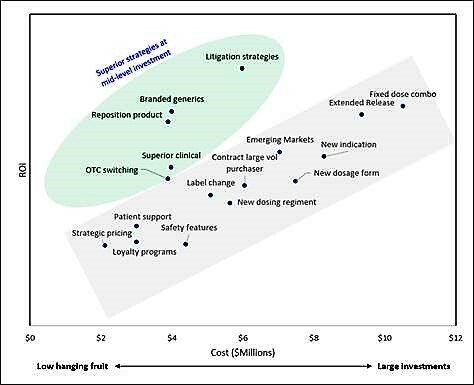 Many pharmaceutical companies use strategies to extend the commercial life of mature pharmaceutical brands and minimize market share decline, but Best Practices LLC and RxSolutions have identified superior strategies across different investment levels from survey results of 25 executives representing 18 companies. Best Practices’ work with pharma companies produced survey data on both the cost and ROI of 20 strategies. RxSolutions then analyzed these results and found that an interesting pattern emerged. As seen below, the least expensive strategies involve Patient Support, Pricing, and Loyalty Programs with an average cost of less than $3M. At this price point, there are no other strategies with superior ROI. For examples of these types of strategies click here. For investments averaging $4M to $6M, there are clearly superior strategies with higher ROIs. For example, the repositioning of a product and utilizing a branded generic generate ROIs that outpace many other strategies. Other parts of the research showed that the aforementioned strategies can most often be executed in less than a year’s time. To view a sample of the research conducted by Best Practices, click here. To learn more about the effectiveness of co-pay cards and adherence programs in an overall patient support plan, you can download a short case study here on changing prescriber & patient behavior as well as patient support benchmarks. For more information, contact: J. Cameron Tew, head of research services at Best Practices, at 919-767-9246 or ctew@best-in-class.com, or David Lengacher, vice president of analytics at RxSolutions at 919.676.0709 or dlengacher@getrxsolutions.com .